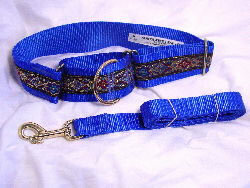 This wide martingale collar is fully two inches wide on the neckpiece and are constructed of smooth nylon webbing. 2″ brass or silver slides are used to attach the neckpiece to the center loop. The large collar adjusts from 15 inches to 21 inches – perfect for Rhodesian Ridgebacks. The XL adjusts from 20 to 25″.